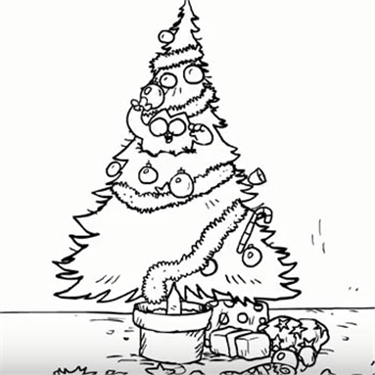 The latest video in the Simon’s Cat Logic is focused on keeping your cat safe and calm during the festive season. Christmas can be a confusing time for cats, with unfamiliar smells and sounds having an effect on stress levels. Behaviour Manager Nicky Trevorrow shares her top tips on a hassle-free Christmas, including advice on decorations, festive food and even the perfect gift to buy your cat. The advice is followed by five festive animations. ‘Santa Claws’ looks at a cat’s obsession with Christmas trees, while ‘Sticky Tape’ focuses on the perils of gift wrapping with a cat around! ‘Little Box’ shows a cat enjoying a cardboard box – the ideal Christmas gift for felines, while ‘Fowl Play’ is centred around a cat attempting to get hold of a delicious Christmas turkey. If you would like to watch the video please click here: What do cats want for Christmas?